20 years after the Scotland Act was passed, how has Scotland fared in its aspiration to reduce inequality? When it comes to social policy, Scottish politicians have tended to look across the North Sea, rather than the Atlantic, for inspiration. The desire to follow the more progressive Nordic model on issues of social and economic inequality has become one of the defining features of Scottish politics in comparison with the rest of the UK. Since the introduction of the Scotland Act in 1998, more and more of the powers needed to achieve this “idyll” have been devolved from Westminster to Holyrood, enabling the Scottish parliament to take a different course to its southern neighbour. Given that 2018 is the 20th anniversary of the Scotland Act, it is a timely moment to take stock. How has Scotland fared in its aspiration to reduce inequality? And can we see divergent paths emerging in income inequality in relation to England? One of the most commonly used ways to measure inequality is the Gini coefficient – the higher the value, the greater the inequality. If the Gini coefficient equals zero, it means that everyone has the same income. If the value equals 1, it means that one person has all the income. 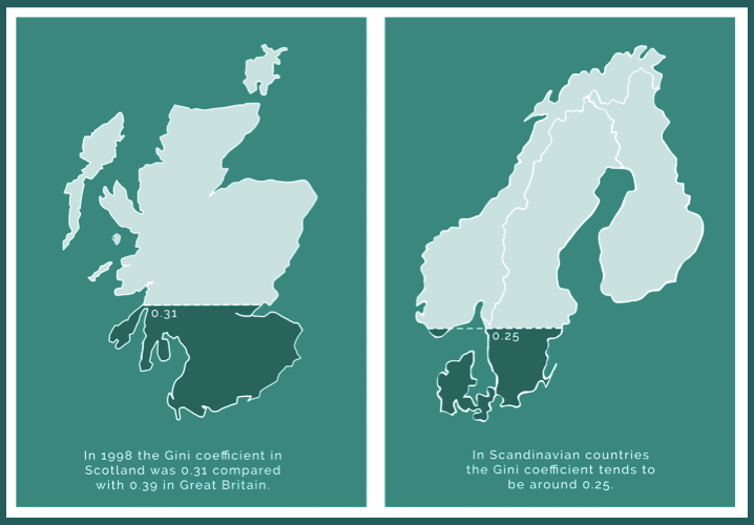 In Scandinavian countries, the Gini coefficient tends to be around 0.25. So has the Scottish Gini coefficient moved closer to this figure relative to England? Unfortunately, there don’t appear to be any published Gini coefficients for England, but we did find estimates for Great Britain as a whole, and also for Scotland. These are plotted in figure 1. 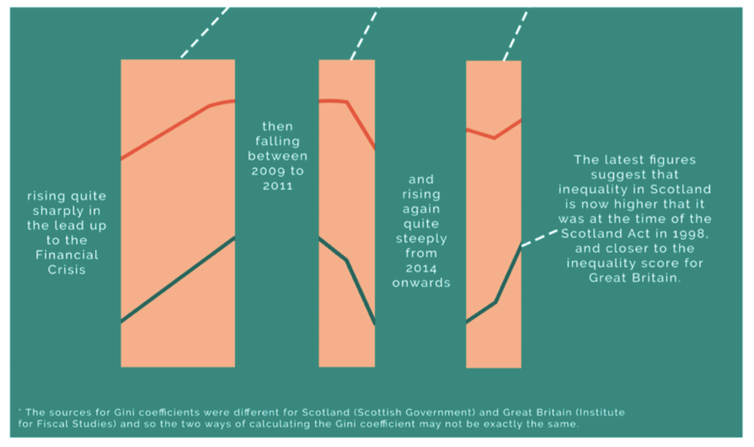 We can see that since 1998/1999, the trend in the Gini coefficient for Scotland doesn’t look much different to the one for Great Britain, rising quite sharply in the lead up to the 2008 financial crisis, then falling steeply, before rising again. The latest estimate suggests that inequality in Scotland is now higher that it was in 2008, moving it closer to the inequality score for Great Britain than the Nordic one. But inequality is not just about income. The experience of inequality is driven by a whole range of factors that affect well-being over a lifetime, including access to employment, the quality of the environment and exposure to crime, among other things. So how has inequality with respect to these important outcomes fared in Scotland compared to England? 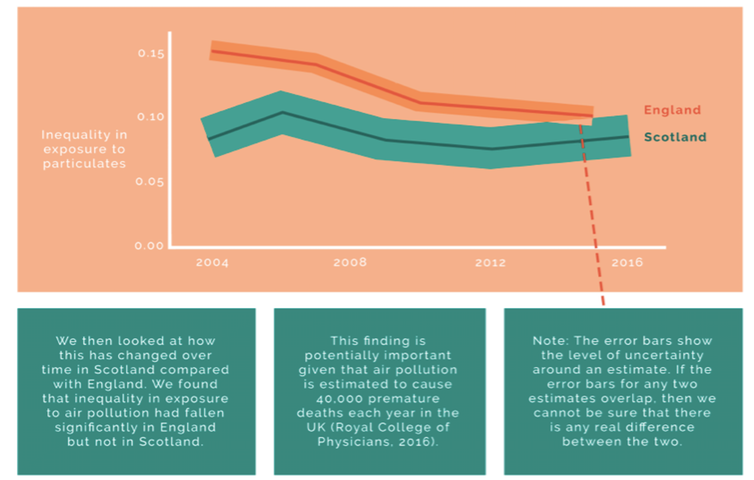 To answer this, we have looked at the extent to which poorer households tend to be located in areas that have worse air pollution, and higher crime than more affluent households, and how this has changed over time in Scotland compared with England. The measure is similar to the Gini coefficient in terms of how it is computed, but this time it is calculated using data at the neighbourhood level, rather than on individuals. The index measures inequality across neighbourhoods within a particular locale in proximity to crime, air pollution and housing quality. Knowing how inequalities are changing at this spatial scale is important because local authorities in Scotland now have a statutory obligation to reduce inequalities within their area. Higher values of the index indicate greater levels of inequality between poor and non-poor people within a specific travel to work area. We see from figure 2 that inequality in exposure to crime has fallen in England but seems to have risen recently in Scotland. Actually, when we take into account the uncertainty in the estimates, shown by the “error” bars – the thinner lines running across each band of colour in the graph – there is no significant change in Scotland. Figure 3 plots inequality in environmental quality. In 2004, this was significantly higher in England than in Scotland. 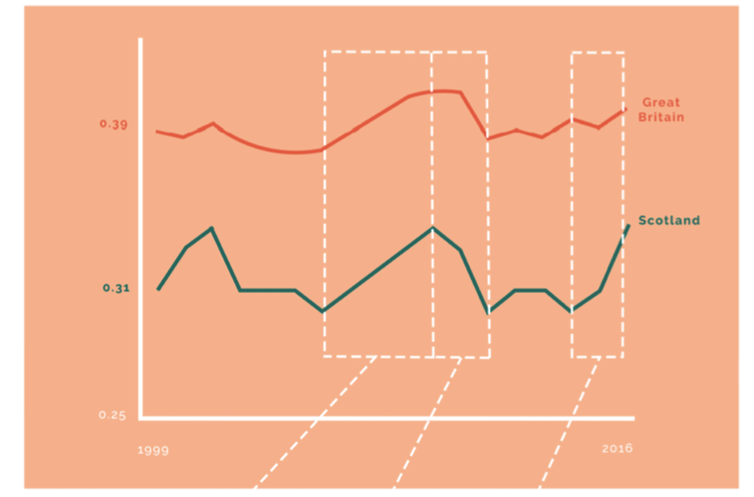 However, since then, environmental inequality in England has fallen steadily, whereas there appears to have been no significant change in Scotland. Our environment data for Scotland only goes as far as 2012, by which time Scottish environmental inequality was no longer significantly lower than in England. So, despite the political rhetoric and aspiration, there is no clear evidence as yet that trends in inequality in Scotland are improving compared to England. In fact, for some measures, things have been improving more in England than in Scotland. One reason for this is the fall in the concentration of poverty in inner cities, partly due to gentrification. This may have helped reduce the inequality in exposure to crime and air pollution, which tend to be higher near the centre of cities, particularly in larger cities in England. All this raises some tricky questions for the next 20 years of devolution. What does Scotland need to do to reduce inequality to the levels of the Nordic countries? In 1999, the Scottish parliament was given the powersto raise (or lower) income tax by up to three pence in the pound. Even if there is the political will to implement a full three pence rise in income tax, would it be enough to make any significant progress? Or will other factors, such as the suburbanisation of poverty – where poorer people are pushed out to the periphery of cities – dominate the experience of inequality? It seems likely that more radical changes, such as significant redistribution of income, labour market reforms and major investment in deprived areas, would be needed to bring Scottish inequality close to Nordic levels. But is there really an appetite for such reform? And then there’s the trickiest question of all: is the only realistic way for Scotland to pursue the Nordic nirvana to become fully independent?